This has also aways bothered me. As usual, Randall, at xkcd, has put in a comic what was in my head. Recently, I was thinking of making a post about how old concepts from the 1400s and 1500s still influence our terminology and words today. One of the most prominent ones you often hear on the news is the reference of Europe as The West and China, et al as the East. That never made sense to me growing up. But if you consider that all of our history and culture is Eurocentric, it all makes sense. Europe “discovered” the world. 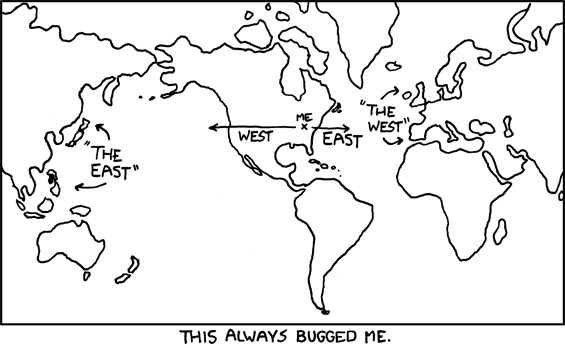 And from Europe’s point of view, Asia and everywhere else in the world was The East. That’s why people weren’t sure that if Columbus sailed West that he would get to the East before he ran out of supplies. Yeah, and the other part that bothers me is how the line between Eastern and Western United States seems to run about through Columbus, Ohio and Atlanta, Georgia. I’m in Iowa, and everybody tells me I’m in “the Midwest”. Well, I look at a US map and to me the middle line between East and West should run about Lincoln, Nebraska. The middle of the Western United States, then, should be about Montana’s and New Mexico’s meridian. It’s tough to be logical geeks and live in this culture, idn’t it?